Biogest has constructed a Gas2Grid anaerobic digestion (AD) plant at Willand in Devon that can be fed with a variety of feedstock including grass silage and fresh cut grass. The plant is located approximately 30 kilometres from the city of Exeter and has a biogas production capacity of 1,000 m3/h. It utilises the company’s PowerRing system which draws on an extremely low proportion of the power it generates, because of the mixer technique feed-in system and overall design. PoweRing is a highly efficient 2-stage biogas plant that is suitable for operation with almost all substrates. The design is based on an external main digester and an internal post-digester. The main digester is a ring canal, which allows a controlled plug flow. The plant also incorporates an insolated concrete lid on the fermenter which could help to massively reduce heat loss. It is completely automated and controlled via a user-friendly operating system. The compact design means that the tank can be simply scaled to the size required according to desired output and the type and quantity of substrate. The biomethane produced from the plant can be injected directly into the natural gas grid. A proof of performance test was completed in August. 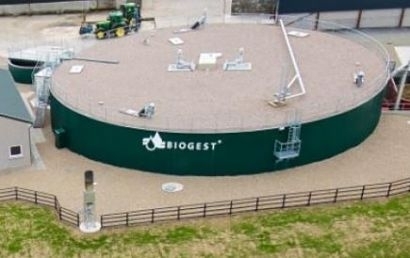 Biogest is an internationally active biogas plant manufacturer and operator with its headquarters in Austria and subsidiaries in the UK, France, US, Italy, Romania, Serbia and the Czech Republic. The company has completed more than 150 biogas plant projects generating electricity or biomethane across several European countries. As a renewable source of energy, biogas offers technological, ecological and economic advantages - energy can be generated 365 days a year, at all times of the day and night, and therefore biogas plays an important role in the mix of renewable energy from water, sun and wind. In addition to helping achieve climate protection goals, biogas also helps reduce reliance on energy imports. Decentralised energy generation also guarantees sustainable local development.